Welcome to The little Green Project 2011! My favorite way to save green is to simply not buy stuff in the first place. There is no need to try to keep up with the Joneses. If you don’t have money, don’t spend it. Even if you do have money, consider carefully if you truly need something before spending the money on it. Like socks. I think it’s okay to spend money on socks…if in fact you need socks. I also think it’s wise to spend money on nutritious food. But stuff? Stuff just gets dusty. Or I step on it in the middle of the night and it hurts. Don’t buy stuff. If you haven’t tried my Strawberry Peach Slushie recipe, you really should. There’s green leafy spinach hidden in there and no one ever knows. These slushies are a great way to eat more greens. Anyway, here’s where you can find my simple, money saving and healthy salad dressing recipes! Look into Heavenly Homemakers Affiliate Program. One of the main reasons we set up an Affiliate Program was to give all of you an opportunity to earn some extra money. We would be so honored and excited if our Affiliate Program could benefit you and your family. Sign up for Swagbucks. Then tell all your friends about it. It’s free. There’s no catch. It’s just a search engine that earns you FREE gift cards. I love Swagbucks and turn most of my earnings into Amazon gift cards. It helps our family buy books and organic groceries…for free. Swagbucks are a wonderful blessing! I’ll combine these two categories because for me, they go hand in hand (or thumb as the case may be). I’m not a gardening expert, but I have been doing this for a few years and have a few gardening tips to share. Here is a link to all of my gardening and preserving posts. We garden organically and in case you want to see my husband holding a bucket of my kitchen garbage (and you know you do), hop over hear to learn how we compost. Well, of all the green tips I have to share, crafting something green may be where I fall short. I don’t do a lot of crafting at my house, mostly because my boys are a little bit too busy building cities and knocking them over to sit down with glue and glitter. I do have a fun post about how to make Flubber…and since you have to put food coloring in it…use green. There. I came up with a green craft. Hopefully you’ve got something better in mind to share. You’re welcome to link up an older post if it fits the above categories. You’re also welcome to link up more than one post. If you don’t have a blog, please leave a comment letting us know of your little Green Project! Then let’s all go visit everyone’s blog and learn more about their little Green Project! 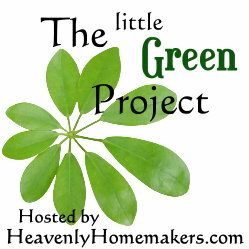 Join us at Heavenly Homemakers for the little Green Project! I’m glad to see you are doing the little green project again! I look forward to getting more great ideas from everyone. Thanks for all the neat ideas, Laura! Just love your blog etc. You are such an inspiration! Fun Stuff Lots of great ideas! Thanks for sharing! Under saving, I would add: use the stuff you have in two ways. No point buying socks if you have yarn lying around and the where with all to learn how to use it. Secondly, make sure you are using the things you own, take stock regularly, and if you find surplus things, sell or gift them. This will ensure that your house is not cluttered with useless things, and a less cluttered house is a simpler life IMHO. Thanks for the links, this is fun. I linked up 2 posts – 1 about my getting rid of debt series based on Laine’s List and the other from my spring gardening series. I’m looking forward to reading all the links and finding new ways to save green with the cost of gas going up. I can’t believe that it’s over $3.60 in our area! This is fun, thanks for letting us link up! We just learned about a really green company/opportunity last night. How timely! I’m super excited about the GREEN all natural (as in no child safety caps natural!) cleaning products, vitsmins/supplements, natural toiletrtries, cosmetics, and more. We are SO. excited to gave safer and WAY healthier options for our family that are cheaper and work better than store brands. PLUS, you can EARN GREEN by referring people. Please let me know if you’re interested in saving money with Melaleuca’s natural products so I can refer you. Theshindels@gmail.com. So…. I made some green cookies! That’s a craft, right? I’m looking forward to visiting everyone’s ideas through the links! I love finding new and creative things to do!! Thanks for this! 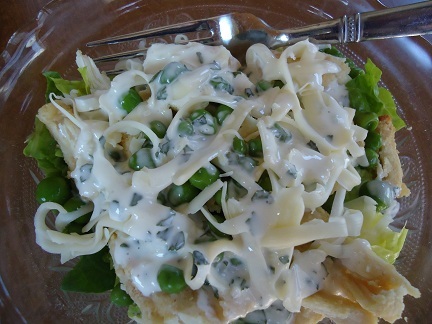 Cooking – I buy in bulk and cook from what I have, only shopping once per month. This saves money in a couple ways. No impulse buying and I save lots of gas. I only make an exception if the local flyer has a HUGE DEAL and I have coupons to go with it. Recycle by only buying clothes (except undergarments) at thrift stores. My 12 year old got a jacket, boots, jeans and 3 shirts for $10.50. Try to match that at anywhere else. Our thrift stores have bogo days, 99 cent days and specials on cloths for certain age groups. These are monthly so if you need boys cloths do you grocery shopping on that sale day. Craft – my kids are making mud mats for the door area out of old plastic bags. They are crocheting them after cutting them into strips. We eat a dark green at least 4 days a week. The vitamin K prevents bloody noses do to dry air. And as for earning more green I am open to ideas. Have a God Blessed Day! Let’s see – I am wearing green today, I am saving green by not spending unless absolutely necessary (its a Lenten thing), eating lots of greens, thus I am learning to grow my own greens, going green by carpooling with my hubby, and making a little extra green by participating in a craft fair in a few weeks. How is that? LOL Have a great GREEN day! Thank you Laura for all your insights. I have to say that, although I am not affiliated with any religion, I agree with everything you post. You have changed my life and the lives of my children more than you could ever know. I don’t even remember how I stumbled upon your sight but it’s only been a few months and I am already making homemade vanilla (saving green @ christmas), I make all my own food (no more boxed stuff keeps me out of the grocery stores), I have switched to a local organic creamery for all my dairy and make as many products as I can from it (staying away from the grocery store even more), I currently have compost going for fall planting, and I have several seeds sprouting for planting time in a few weeks. We have started eating local organic as much as possible (helping the planet stay green)and even saving green doing it. And that’s just to name a few of the things we are doing because of your site and the whole community you have here. Since we have made these changes I have seen tremendous improvments with my chilren’s behavior, namely my son. He is 12 and has mild autism. Since we have started using coconut oil, soaking grains, getting rid of pesticides and preservatives he has been much happier and his ‘tics’ are almost gone. He still has issues we need to work on but he is making great improvements, especially in school (No F’s!!!). He is also VERY excited to help me with our organic garden as I will need many ‘garden-friendly’ bugs to keep the aphids and such away (he’s my little entomologist). I check your site several times a day for any new tidbits of info. I love the conversation here and I feel like it’s my ‘adult-time’ so I look forward to reading the comments lol. Darn it….I meant “inspiration” lol. That’s the second time today I have done that. 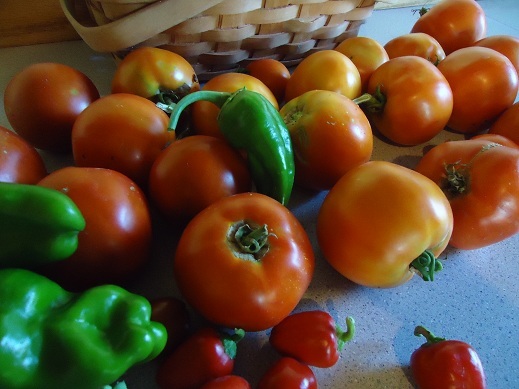 So excited about going GREEN this year– eating more vegetables! One way I have begun to save green recently is by making tags to go on gifts that I give instead of buying cards. You can make gift tags out of card stock,stickers,and whatever paper you used to wrap the gift in. The gift tag can be much more personalized than a greeting card, and save lots of money! Greeting cards are like 3 to 4 dollars now! I’m loving all the green ideas! Inspiring! Do you have a current link for The Mystery Shopper? I know this post is almost three years old, but I was just wondering. Thanks. Hmm, sorry that I don’t!